Party Poker Free Play is the easiest way to try out the Party Poker software before making a real money deposit. You can use play money to participate in both cash games and tournaments in order to become comfortable with the Party Poker software and improve your poker game without risking anything. Play money tables are absolutely free. 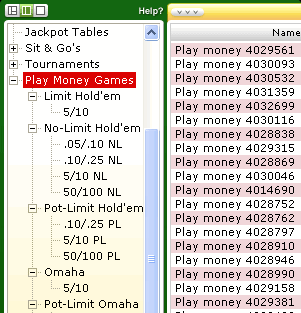 All players are initially credited with $1,000 in play money to use. If you have zero remaining play money chips, simply click on an open seat at a play money table, and choose to add more at the buy-in window. You can’t get more play money chips if you are in the middle of a hand, are currently playing a tournament, or you are only viewing a table. To add more chips while at a table, click the dealer tray. There is a minimum of five minutes between requests for more chips. Play money is the best way to try out Party Poker free of charge.